The rule of thirds is pretty much instinctive by this time, Kelly. But just as a reminder, I purchased a camera that has among its LCD display options, a composition grid. It shows me nine rectangles, just like a tic tac toe game. I try to place my subject roughly one box length from the right or left and one box length from the top or bottom of the frame. I take great pains to keep it out of the center box, which usually makes a static image. Thanks, Julian, for linking your shot of the Arno rower to my own. Your image uses a different concept than mine, and it works very well as expression. As far as the "realm of art" goes, I am flattered by your accolade. I make the pictures and leave any judgement as to what makes art to others. Art always arises in the eye of the beholder. What seems to be art to one person, may not be to another. Art is an expression of human creativity and imagination, and usually has great beauty or the power to stir an emotional response. If this image does that for you, then it is art, and I thank you for the complement. Phil, there is something special about your picture that moves it into the realm of art. I can't quite put my finger on it. Thanks for this comment, Benchang. Yes, the bridge is important here. It gives the length of that river a sense of scale, and by linking the buildings on both sides, it also creates a continuous arc of structures that embraces the tiny boat with still another layer of scale incongruity. I like the bridge, or there beyond another one. Interuption like this gives me more remoteness of the canal, if you agree. Thank you. Thanks, Mikel, for noting the importance of reflectance areas in this image. I always try to be critically aware of what is being reflected in my images. In this case, I wanted to make the sure that the boat would be within that part of the water reflecting the sky, and not the bridge or the buildings. Otherwise, there would have been a distracting conflict in context. Good point, Clara, about the color contrast bringing out another difference between present and past. Besides the contrast in dimensions between river water and the canoe, it strikes me the contrast between the vivid colors of the canoe with the peaceful ones of the environement, which also talks about present and past. Good eye, Nut. I saw this image as an example of scale incongruity. You see it as an incongruity in time, contrasting old city to new boat. a million of color world. This is one of my ancient images. An image shot on that artifact known as film with my old Contax G2. Once again, you've spotted an incongruity that had previously eluded me. (You do this to me over and over again, Maureen!) An escape from the past, in a place relentlessly visited for its past. The boaters are very much of the present, even while the Arno is lined with buildings that once may have been owned by the Medicis. It is ironic, of course, that you've picked one of my oldest images in here to talk about quick escape from the past. A quick escape from the past. I really like this. You picked up an important point here, Bruce -- there is indeed more than just a scale contrast here, although that is the main thrust of the image. There are also contrasts in new vs. old, water vs. land, low vs. high, near vs. far. Such contrasts are what photography is all about. Sleek, smooth, colorful, new kayak vs. weathered, textured, faded old buildings. Vanessa, what a wonderful point. You are reading this photograph for its symbol meaning, as well as its aesthetic and documenary values. Thanks for adding a new dimension to this image. I love the colors in this picture. The kayakers rowing out of sight seem to illustrate how this city has seen many people come and go, all the while, it remains unchanged. BZ, I love the things you see in my pictures that I've somehow missed. "Leaving a water trail for the next generation..." Marvelous. As for those "cold colors and luminous waters..." that's only light I had to work with that day. We only had six hours to spend in this lovely Tuscan city on that trip, and it happened to be partly cloudy with rain showers. I'll have to let other photographers bathe their Florentine imagery in gold. These colors worked for me. The tiny gnat-like rowers...leaving a water trail for the next generation! 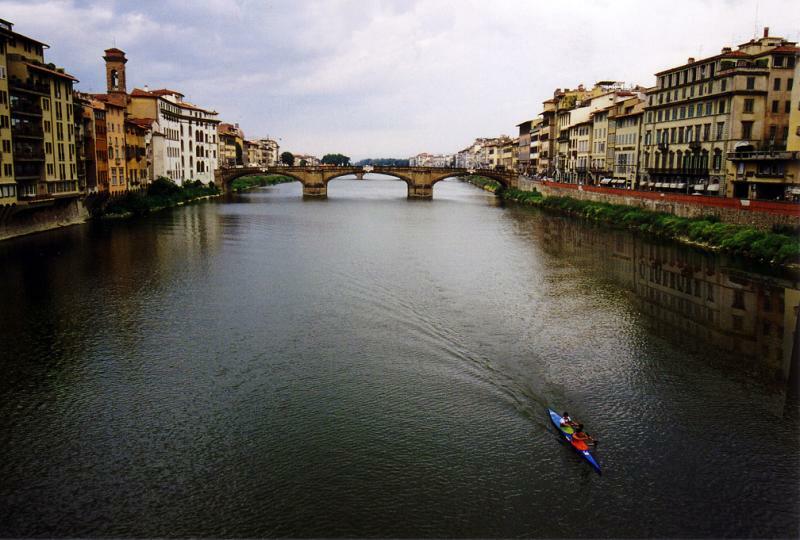 The cold rich colors...luminous waters.......an unusual gradation for Florence...usually she is bathed in gold. I love your version of this Italian beauty. You're right, Carol -- the color contrast in this picture was almost as important to me as the scale incongruity. And this picture is also about movement, as you say. Both the Arno and the kayak are flowing beneath this ancient bridge as we look down on them from this high vantage point. Again Phil, the colors tell a story too. The bright clean colors of modern athletic equipment of the kayak, contrasts with the more muted colors of the old architecture. I love the composition too...so much movement.